This piece is called Mirrored Mexican Horns and I think it looks perfectly at home “growing” among the prickly pear and barrel cactus. The green, tendril-like arms seem to be spreading with wild abandon so that the pink blossoms in the center can erupt and show-off their stunning beauty. This is the last day of Chihuly: The Nature of Glass. All of the amazing glass sculptures with be carefully dismantled, packed, and shipped to the next destination wherever that will be. Next week the garden will back to normal showing off the vast natural splendors of the desert southwest. 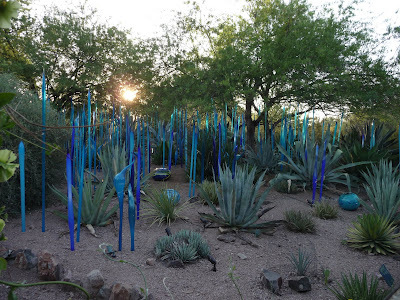 Chihuly: The Nature of Glass ends this weekend after it’s long run at the Desert Botanical Gardens. I, for one, will be sad to see it go. I’m sure that I’ve spent more time at the garden this year than I ever had before. The pieces are so beautiful and they fit into the garden so nicely. Since today and tomorrow are the last two days, I thought I’d feature two more photos from the exquisite show. In this one I caught the evening sun just before it set. : Back in February, I posted some information about a local grocery chain named Basha’s. Lately I’ve noticed that they have started to paint their trucks in the color of the Arizona State flag. They are using blueberries for the blue, strawberries for the red, and lemons for the gold. What a clever idea. On May 2nd I posted my attempt to get a photo of a saguaro cactus bloom. They are so difficult to capture because they are so tall. Well, while I was stopped at the side of the road over the weekend I spotted a saguaro cactus that had one arm that was pointed downward instead of the usual up-swing. And, that arm of the cactus was full of blooms and buds. I walked over to it to get the above close up shot. I don't know the name of those tiny little winged bugs that are busy crawling all over the flower. I do know one thing for certain, they bite and the bites itch! The things we bloggers will do to get a good photo are endless. Now if I could just get the itching to stop. The small photo shows more of the cactus arm that is pointing down toward the ground. Monday was Memorial Day in the United States so many people including me had the day off. On Saturday, I drove up north to stay with friends at their mountain cabin. While driving across the desert, I kept seeing trees with pink/purple flowers on them and I couldn’t recall seeing so many of these trees before. I have no idea what they are, but they are as plentiful as the palo verde trees that I featured here. I became so distracted by these trees that I pulled over and get a better look. The picture above is a close up of the flowers on the tree. The small picture shows the whole tree. If any of my desert dwelling readers know what kind of tree this is, please let me know. Tomorrow I’ll show you what else I spotted when I pulled over on to a side road. These three old adobe and stucco houses are also located on the edge of downtown Phoenix. Judging from the neighborhood, these were probably built in the late 1940’s when the city was much, much smaller. These homes were probably not considered to be near downtown in those days. Today I’m moving away from the historic buildings among the palm trees to a more modern condominium building. This complex sits right on the edge of downtown Phoenix. I don’t know anything about the architect but, I’d say they have a real “urban warehouse” kind of look. The old date farm also had a rather palatial home that the owner occupied only about a quarter of a mile from the farm buildings. The home contained 26 rooms; 6 master bedrooms, 5 baths, and 3 servant bedrooms also with baths. It was built in a Spanish Ranch style in 1925 and made of adobe brick, concrete block, and stucco. In the late 1990’s, it was sold to a developer who wanted to build single family housing on the property. He decided that he would be doing a disservice to the neighborhood if he tore down such a proud and well built home, so he decided to integrate the old house into his new community. The gated community is called La Hacienda in honor of the old home. He modernized the old buildings and built new condominium style homes around the property and blended the two together. Unfortunately , it is all behind the gates of the community so I couldn’t stroll the grounds and locate the older building. I had to settle for this photo through the gates that at least gives you an idea of the look of the place. I’ll end my little tour of the old date grove with this shot of one of the trees looking straight up. This variety of date palm grows straight and tall and when trimmed, has a beautiful crown of palm fronds. I’ve added this old post card that I found when researching the history of the groves. What struck me about this picture is how short the trees are in comparison to today. This area is on the other side of the old packing house. In addition to the tall palms, the area is also shaded by very large eucalyptus trees and a few mesquite trees. The courtyards are shaded and quit. The small photo is of a door to one of the units guarded by a very relaxed cat. These old gates appear to be originals left from when this was a working date farm. They are located in several areas around the buildings. I love that they were left here at the entrance to the areas where the homes are now located. The buildings to the right and ahead were part of the offices, garages, and employee apartments. The small photo shows another one of the gates leading along a different walk. This building is part of the old packing house where the dried dates were packaged and shipped to the retailers. It has now been divided into individual condominiums. Doing a little research, I was able to find this photo of one of the original labels for the packaged dates. Palma Viva is the name of this little condominium community built around the original date farm buildings. You enter from a narrow private drive lined with these tall trees. I’m standing in the middle of the drive looking up into the row of trees. On my left is a row of homes built in the 1970’s and constructed to blend in with the already standing farm buildings to the right of the driveway. At the same time the newer homes were built, the old farm buildings were being converted into small condos. Tomorrow I’ll feature a photo taken around the older buildings. While walking around the area with camera in hand, I met a lovely lady who invited me into her home and gave me copies of some of the historical information about the site. Included in the papers she gave me was the sketch in the small photo. It depicts the entrance drive into the area. The drive is narrow and well shaded making it difficult to see from busy 44th Street and offering the residents inside the walls a quiet respite from the busy street only a few yards away. There is a neighborhood in east Phoenix that was once a date palm grove. In fact this whole area was dedicated to citrus and dates and much of it was part of Phoenix Date and Citrus. The property was sold to Charles Gilliland in 1923 and it became known as the Gilliland Groves. It was 108 acres producing citrus and dates and at one time was the largest date grove in the United States. I took this photo from 44th Street so that you could see the expanse of trees that dominate the area. You can see the roof tops of modest single family homes that were built in the area during the 1970’s. In the distance you can see a dense grove of trees. In that area, the buildings that belonged to the original date farm are still standing and have been lovingly converted into condominiums. Over the next few days, I’ll take you on a tour of that historic area so you can see what it is like living among the tall date palms and the old eucalyptus trees. This tiny little deli has been in business in midtown Phoenix for about 60 years. In addition to a very large menu of just about any kind of sandwich you can think of, it also carries a very large stock of cheeses from all over the world and imported food products you won’t find anywhere else. In spite of its tiny size, there are a few tables inside for in-house dining and counter service for the carry-out crowd. I love the great 1950’s style neon sign on the front of the building and oh yes, the sandwiches are great! More than just cactus are blooming in the desert. I spotted these three trees on my way to work and thought it was interesting to have three different blooming tress so close together. This month’s theme for Arizona bloggers is almost too easy. I say that because there is so much in bloom right now in Arizona. Trees are bursting with flowers and the cactus can’t contain themselves. 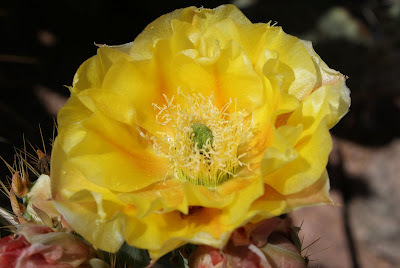 Here is another cactus flower that I photographed at the Desert Botanical Garden. This one was on a prickly pear cactus. It’s brilliant, waxy flowers attract the bees and hummingbirds that will help to pollinate the plants. I went back to the Civic Space park on Sunday afternoon to capture a photo of “Here Secret is Patience” in the daylight. In this photo you can see the cables that support the rings and two of the three poles that support the structure. It is quite a sight in the daytime but, it is the night when it truly shines. I love this new art piece and the wonderful public space that goes with it. It’s a beautiful addition to downtown Phoenix. Another feature of the new Civic Space Park is this fountain that shoots up water in different patterns so you don’t know where it will pop up next. It was very popular with the kids and quite a few adults too. Playing in water! No one grows tired to that! These light pillars are another feature of The Civic Space Park in downtown Phoenix. They change colors and patterns. When I took this photo they were looking like flames. Later they changed to a look of cooling water. There are 14 pillars in all and they add another interesting feature to this incredible space. There is a new park in downtown Phoenix called The Civic Space Park. It was developed in partnership with the city of Phoenix and Arizona State University. This space has amazing features but, it is completely dominated by a brilliant art work called “Her Secret is Patience”. This piece is the creation of Janet Echelman, an international artist known for sculpting exciting public spaces. Last Friday after dinner with friends we stopped at the new park and found it full of people enjoying the warm evening, the band playing and the incredible art features around the park including this huge masterpiece floating above the park area. I apologize that the photo is a little bit fuzzy but all I had with me at the time was the small point-and-shoot camera. I will make a point of getting down there with a tripod someday soon. If you would like to see more of Janet Echelman’s work including a piece similar to this one in Porto Portugal and one being built in Vancouver for the 2010 Winter Olympics, visit her site. I’ll show you some of the other features of the park in the next few days. Yesterday I displayed a photograph of the shoe I wore to a formal event. Today I show you a pair I spotted at the event. There is a lot of "bling" going on with this pari of shoes. They are a little too gltizy for me. In my book, it’s all about the shoes! Yes, I’m one of those “Carrie Bradshaw” kind of women who just loves shoes and tonight I’ll be wearing these beauties to an event called “Night for Life”. It’s a benefit for the Southwest Center for HIV/AIDS, an event I’ve been blessed to attend for about the past 10 years. This year’s entertainment will be provided by Harvey Fierstein, the Tony Award winning Broadway actor best known for his roles in “Hairspray” and “Torch Song Trilogy”. It will be a great evening abundant with my kind of fashion statements. Maybe I’ll even catch a great shot I can share with you on Sunday! Since I’m on the subject of fashion, I thought I’d throw in one more interesting fashion statement. This one is the "Goth", all black, leather and studs look. Of course, it would not be complete without some tattoos to accessorize it. It's another one of those fashion statements that I'm not quite sure what the message it's supposed to deliver. But, I say "C'est la vie"! Let's hear it for individuality. Viva la difference! Following up on yesterday’s post, if you are going to let your underwear show, you might consider these colorful tie dyed briefs. I discovered this psychedelic clothing line at my local Farmer’s Market. I think I might have had a T-shirt that looked a little like this many years ago. I learned at a very young age that it was not acceptable to wear torn and tattered clothing and it was totally taboo to let your underwear show. My how times have changed. I see both men and women wearing clothes, particularly jeans with gaping holes and shredded fabric. In fact, I’ve seen in some stores that you can actually buy them that way. I know it’s a fashion “thing”. I just don’t know what the message is supposed to be. In areas of the United States where there are large Hispanic populations, cinco de mayo is celebrated with great gusto. Although, in Mexico where it originated it is only celebrated in certain regions of the country. It actually commemorates the defeat of the French in the battle of Puebla in 1862. In the United States, it’s a good reason to eat Mexican food and drink a few margaritas. Every Mexican restaurant in town will have some type of special celebration today! Today’s photo is of a Mexican fountain that sits outside one of my favorite Mexican restaurants. I might just have to stop in for a margarita! There are said to be over 300 species of agave plants but currently only 200 are recognized. Most of these plants are monocarpic meaning they produce fruit or blooms only once in their life. However, there are several species that can flower several times during their life. The flowers of the agave plant are as varied as the species and they are considered “perfect” flowers because they contain both male and female parts. The plants are either pollinated by bats or by insects depending on the scents they produce. 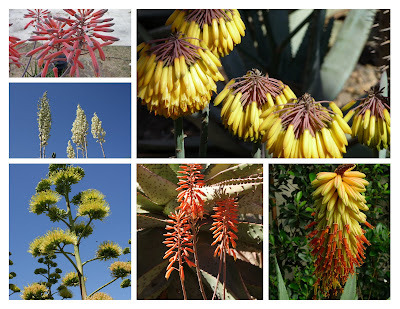 Here I have put together a collage of agave blooms I’ve seen around town. Two of them are right in my back yard. Last year I feature a photo of this cactus in my backyard because I was surprised by the two beautiful flowers it produced. JM of Oeiras and Environs Daily Photo told me it was a type of echinopsis cactus. Well this year it produced even more beautiful flowers. The flowers are just stunning when the open up but, sadly they only last for 24 hours. Everywhere you look in the Arizona desert you will see cactus in full bloom. And, the blooms are just gorgeous. Even the most severe looking cactus produce beautiful flowers. Today I feature the blooms of the giant saguaro cactus. The blooms appear at the top of the limbs of the cactus so you can’t always get good photos of them. Especially when you are only 5 foot 2 inches tall! This one had a short arm positioned only two feet above my head so I was able to use a telephoto lens to get a better shot. I spotted these shadows on the Central Avenue side of the Phoenix Art Museum two weeks ago and knew then that I had to go back to get a photo. The shadows come from the late afternoon sun and a row of palm trees that line both sides of Central Avenue in this area. It’s a work of art created by nature.